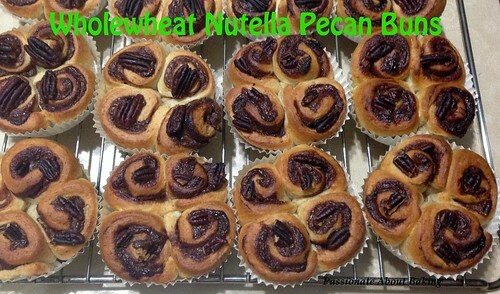 Recipe for Wholewheat Nutella Pecan Buns, modified from 天然蔬果酵母麵包. 1. Knead all the ingredients, except butter, with a dough hook on slow speed for 3 mins. 2. Add butter, continue kneading for 1 min, then turn to medium speed for 8 mins. Test for window pane. Then proof for 60 mins or double the size. 3. Weigh out each dough to 60g, shape it and it rest for 10 minutes. 4. 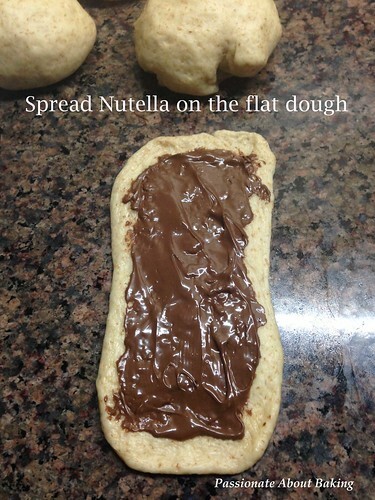 Then roll it flat, spread Nutella on it generously. Roll it up like swiss roll. 5. Cut into 4 equal portion. Place it on a paper cup. Do it for the rest of the dough. 6. Let it proof for at least 45mins or until the dough doubled. 7. 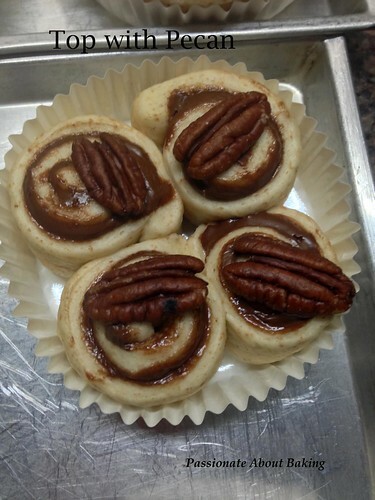 Top with pecans. Preheat oven to 190C. 8. Bake for 16 minutes. 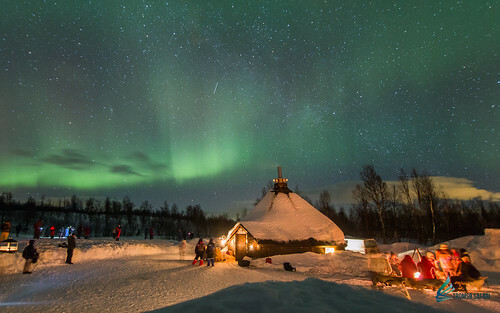 Tent the top if it gets too dark. 9. Let it cool completely before serving. There are some not-so-healthy snacks which many people still like to indulge - Nutella for one, Oreo for another. Being a health conscious person, one would rather make their own of similar type, but the taste might or might not be the same. Somehow, I still prefer to buy these if I need them. As much as I try not to eat too much, often, I have request to use them for baking some goodies. 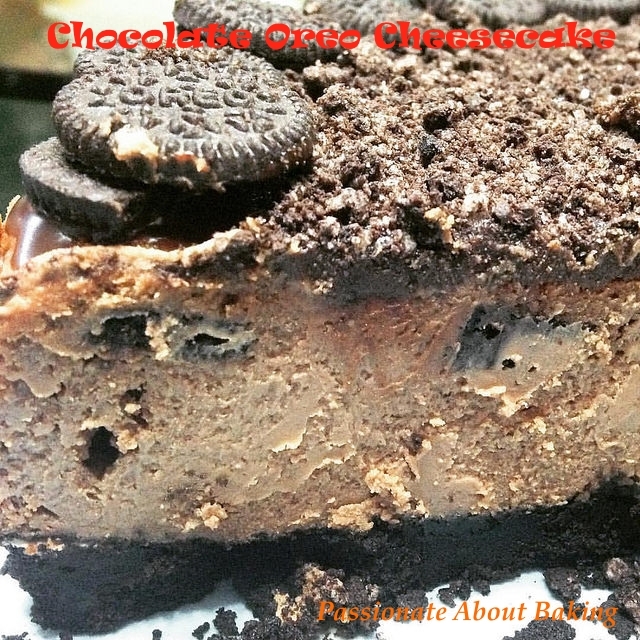 Recipe for Chocolate Oreo Cheesecake. 3. Baked in a pre-heated oven of 160C for 5mins. 3. Add in the melted chocolate gradually. Ensure to mix well. Add in rum and mix till incorporated. 4. Pour half of the cheese batter into the pan. Arrange the mini Oreo randomly. Then carefully add the rest of the batter. 5. Bake in the preheated oven of 160C for 40mins. 6. Once done, turn off the oven and let the cheesecake cool in the oven completely. (I left it overnight.) 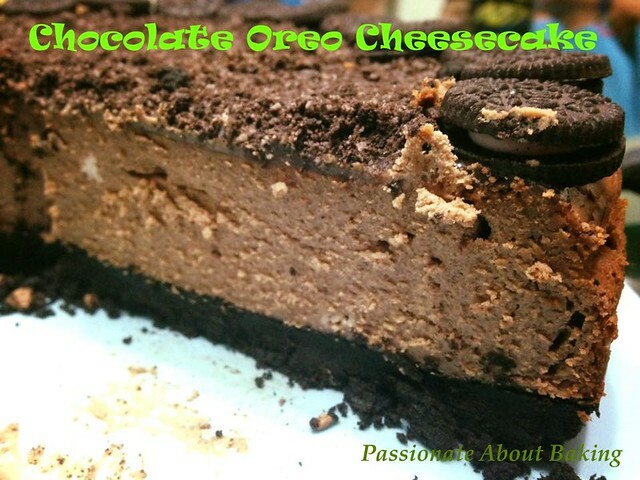 The cheesecake cracked with humps. 8. To decorate, spread the ganache to cover the top completely. 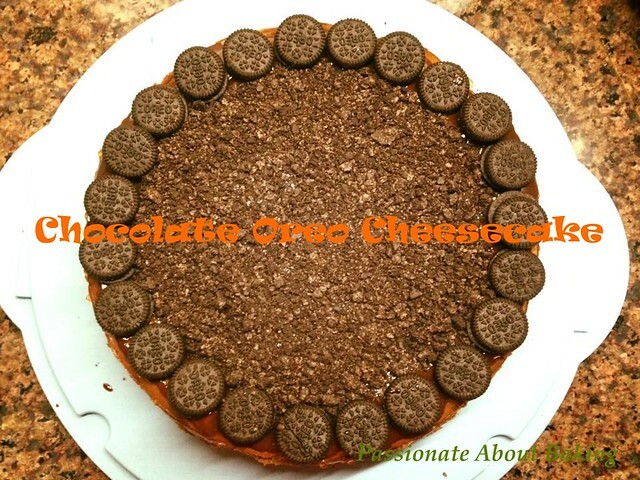 Arrange mini Oreos around the perimeter of the cake. Then sprinkle crushed biscuits in the centre. Refrigerate well. 9. Before serving, remove from the fridge and left it outside for at least one hour. Slice, serve and enjoy! I was hoping to use my cast iron pan more often since I got it almost a year ago. As my helper seldom use the cast iron pan, I was afraid it might become white elephant at home. So I figured I'd better use it more often. A sudden craving for cake made me bake a blueberry skillet cake with added pecans. The verdict for this cake is really good. 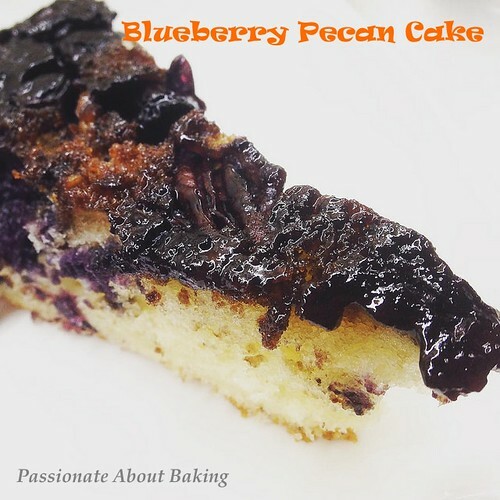 With loads of blueberries and pecans on the cake, it gives really good texture. I would exclude caramelising if I were to make this again. The caramelised sugar didn't turn out too well for me since I reduced the quantities. I also made some changes to the steps. Recipe for Blueberry Pecan Cast Iron Cake, modified from Taste of Home. 3. In a large mixing bowl, cream butter with sugar till light and creamy. Add in egg and mix well. 4. Alternate yogurt with flour. Mix until incorporated. Pour over blueberries. Spread out evenly. 5. Bake for 20 mins or until a toothpick inserted in center comes out clean. Cool 10 minutes before inverting onto a serving plate. You probably know what is the existing trend for baking if you follow some Facebook group or some Instagram posts. 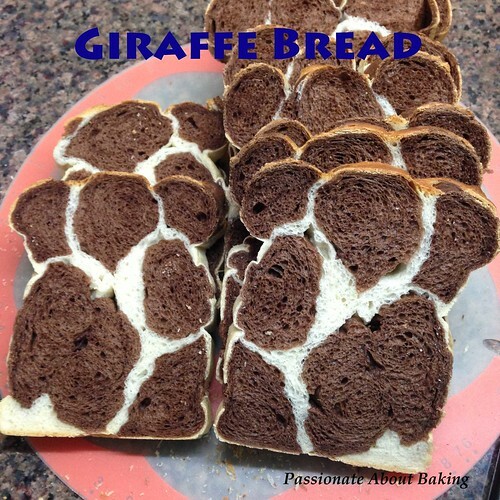 I rode on the wagon of baking this Giraffe Bread when I first caught hold of Victoria Bakes' post on a FB group. I like her recipes because I found them to be rather foolproof and usually it turns out good. 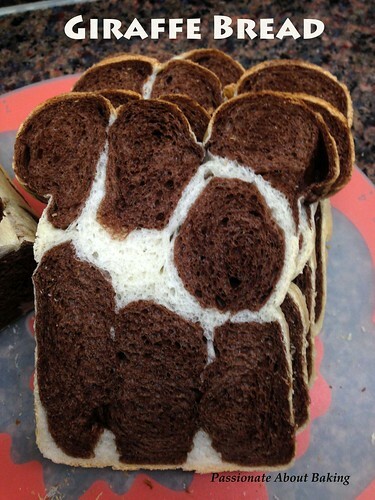 Though my bread wasn't as pretty, at least from one look, it is still recognisable as giraffe print. And the bread stays soft on the third day too! 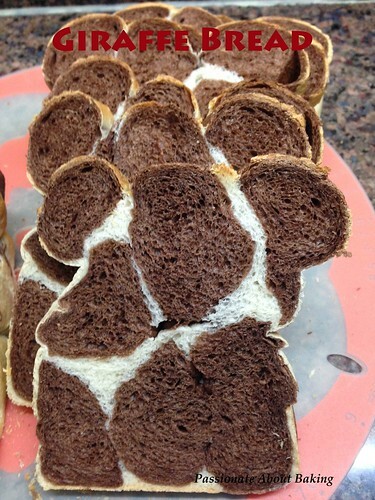 Recipe for Giraffe Bread, modified from Victoria Bakes. 1. Mix all ingredients together, except butter, and knead till you get a dough. 2. Incorporate butter, knead till window pane stage. 4. In the remaining dough, knead in cocoa powder and milk. 6. Punch the doughs down and divide each dough into 8 equal portions. (I divided into 16 since I doubled the recipe. But it was too small. Stick to 8 portions just nice.) Rest for 15 mins. 7. 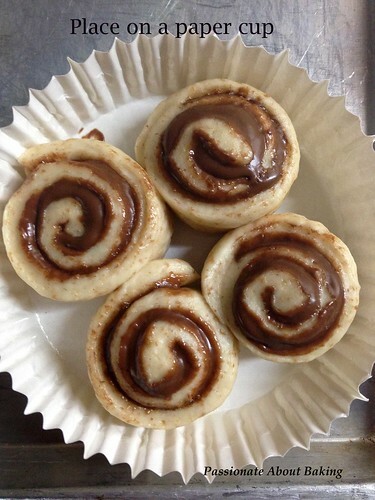 Roll out one portion of chocolate dough into a flat rectangular sheet then roll up lengthwise. 8. 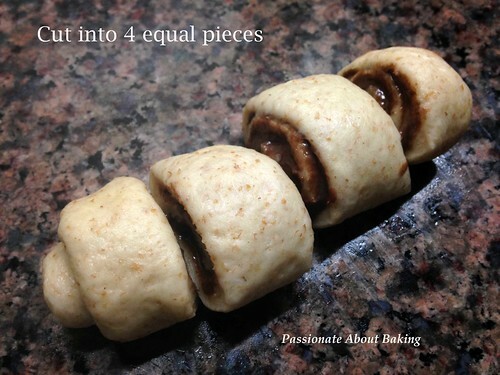 Take a portion of original (white) dough, and roll into a flat rectangular sheet. 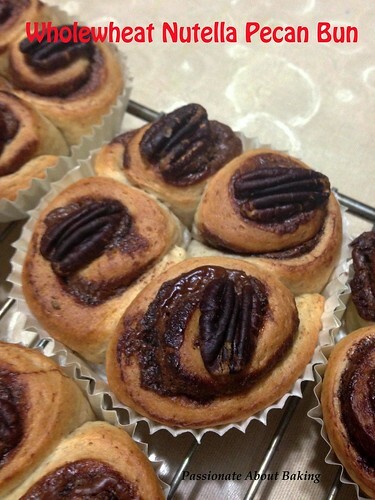 Place rolled chocolate dough in the middle and wrap white dough around it. Seal seams well. repeat this process till all dough has been used up. 9. In a regular loaf pan, place 3 rolls on the bottom of the pan, then top with 2 rolls, and finally, 3 more rolls on the top layer. 10. Proof till the dough reaches 80% of the height of the loaf pan. 11. Bake in preheated oven of 180 degrees for 35mins. Tent the top if it started to burn. 12. Cool loaf before slicing. Enjoy your giraffe patterned slice.